Corned beef and — what do you do with the leftovers? Top ‘o the mornin’ to you. Thought I’d get a little jump-start on the festivities with a proper breakfast — made with a wee bit of leftover corned beef and cabbage from last night’s dinner. (I’m going out tonight, for seafood.) Perhaps you’ll be setting out this evening to celebrate St. Patrick’s Day by lifting a pint with some friends at a proper Irish pub. If so, where are you headed? (Need some ideas? Try these.) And to those of you who’ll be keeping the home-fires burning, cooking a bright pink slab ‘o meat with some brine-soaked greens, I’ve got to ask: What do you do with the leftovers? 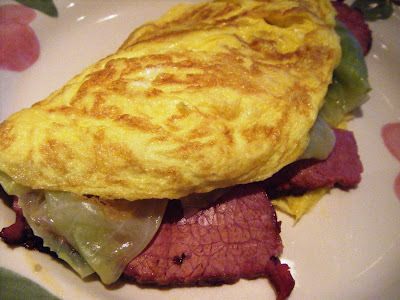 A meal so nice, I made it twice: corned beef and cabbage omelet.